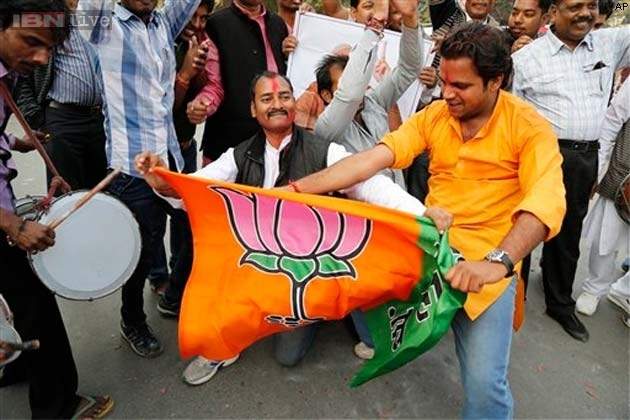 New Delhi: It was a Bharatiya Janata Party (BJP) wave in Rajasthan and Madhya Pradesh while the party managed to retain Chhattisgarh in the Assembly elections by a slender margin. But the biggest story of the elections and perhaps in the electoral history of India came from Delhi where the Aam Aadmi Party, a motley group of idealistic people with a clean image and the desire to end corrupt electoral practices, shattered the power equation by decimating the Congress and stopping the BJP victory march. For Congress the annihilation in Rajasthan, Madhya Pradesh and Delhi coupled with a narrow loss in Chhattisgarh not only came as a major shock but also firmly put it down on the mat as the party-led UPA government, too, is facing a tough time cornered by allegations of humungous corruption, price rise, economic slowdown, policy paralysis and poor leadership. Even as the BJP projected the party’s massive win as a wave in favour of its prime ministerial candidate Narendra Modi, in Delhi the AAP broom put a spanner in its wheels. The Arvind Kejriwal-led party not only swept the 15-year-old Congress government of Sheila Dikshit out of power but also put paid to BJP’s hopes to registering an outright victory in Delhi. Kejriwal himself was the giant killer as he defeated Sheila by 25,864 from the New Delhi seat that she had won in the last three elections. AAP, formed just a year ago, made a thunderous debut as its candidates, most of them greenhorns in electoral politics, not only brought down the Congress citadel but also gave a big scare to the BJP as the broom lost several seats by less than 2000 votes and provided the electorate an alternative devoid of identity, caste, community and patronage oriented polity – a strategy that will be tested more severely when the party decides to expand. The AAP had an impressive election strategy with door-to-door campaigning, streets corner meetings, bring back to life the Gandhi topi (cap) with ‘aam aadmi’ and ‘aam aurat’ written on it and smart use of social media. The party showed the two national parties that the electorate can be won over by unknown but clean candidates. It never failed to point out that broom, its election symbol, was going to clean the filth permeating the Indian political system. While the BJP banked on the good work of its state governments in Madhya Pradesh and Chhattisgarh, in Rajasthan it was the lacklustre administration of Ashok Gehlot that handed the party a historic mandate. In Delhi the fatigue with Sheila Dikshit along with the arrogance and insensitive of party leaders gave the AAP an open field as the party while the BJP tried to do its best but still fell short of majority mark in the 70-member Assembly. For the Congress, relying heavily on the Gandhi family especially Rahul Gandhi to pull it through, it was black Sunday as its hand wilted under the onslaught of the lotus and broom. Devoid of strong leaders in the state and with the High Command dictating terms from New Delhi, the party had no answers to the well-oiled machinery of both the BJP and AAP. While Rajasthan and Madhya Pradesh voters gave a landslide mandate to the BJP, in Chhattisgarh the party just about managed to retain power after a close battle with the Congress. Vasundhara Raje led BJP to a historic victory in Rajasthan with the party winning 162 seats out of the 199 that went to polls while the Congress was way behind with only 21 and others bagged 16. Shivraj Singh Chouhan had an easy time in Madhya Pradesh against a divided Congress as he secured an even bigger win for his party than the 2008 elections and credited BJP prime ministerial candidate Narendra Modi and party workers for the success. But Chhattisgarh was not a very easy game as leads kept on changing between Congress and BJP throughout the counting process and the latter managing to bag the state only late in the evening. But with three states in its kitty and the party taking the pole position in Delhi, the BJP has delivered a sucker punch to the Congress and secured the much-needed momentum in the run up 2014 Lok Sabha elections. Final Assembly election results: Madhya Pradesh – BJP 165, Congress 58, BSP 4, Independent 3. Rajasthan – BJP 162, Congress 21, Others 16. Chhattisgarh – BJP 49, Congress 39, BSP 1, Independent 1. Delhi – BJP + Akali Dal 32, AAP 28, Congress 8, JDU 1, Independent 1.